Live from the Royal Albert Hall, London, Endymion and the BBC Singers perform two famous works by Steve Reich: It's Gonna Rain and a chamber version of The Desert Music. 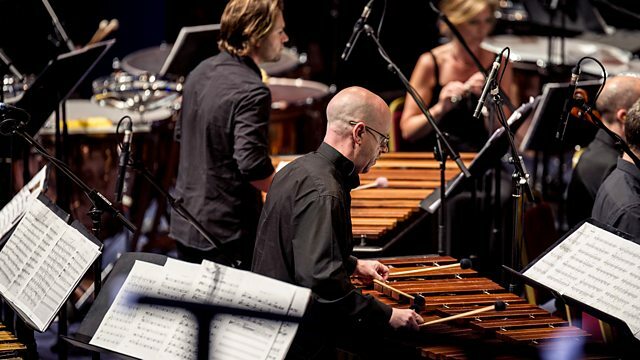 Heaven and hell come together in a late night Prom which includes Steve Reich's extraordinary musical vision The Desert Music' which tells of the end of the world as imagined in the apocalypse of the post-nuclear age. Texts by William Carlos Williams are set for amplified voices, strings, synthesisers and a huge array of percussion; since its composition in 1983 it has become one of Reich's most iconic works. Paired with it, 'It's Gonna Rain' - an early experimental tape piece layering the recorded sound of a charismatic street preacher. Donald Macleod talks to one of the world's most celebrated living composers, Steve Reich. Orchestra: Endymion. Conductor: David Hill.